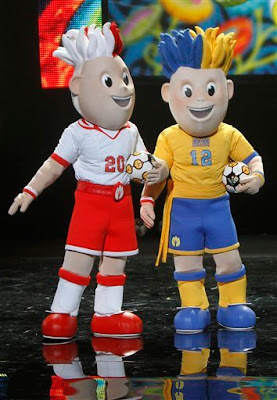 WARSAW, Poland — Meet the mascots for Euro 2012: identical twin brothers in the soccer uniforms of Poland and Ukraine, with shocks of hair in the colours of their nations' flags. Twin brothers in soccer dresses, one in Ukraine's blue and yellow colors, one in Poland's white and red, are presented in Warsaw, Poland, Tuesday, Nov.16, 2010 as the mascot of the Euro 2012 championships that will be jointly hosted by the two neighboring nations. UEFA presented the mascots on Tuesday but is still seeking names for the twins. It is inviting the public to submit suggestions — names will be chosen by Dec. 15. 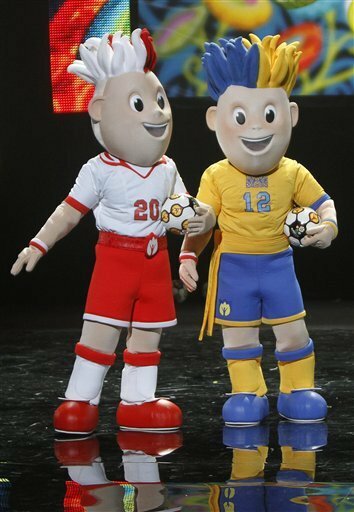 One of the grinning mascots is decked out in Poland's red and white national colours and the other in Ukraine's blue and yellow. Four cities in Poland and four in Ukraine are to host the championships. The tournament is to open in Warsaw and the final match is to be held in Kyiv, Ukraine's capital.